The start of the Mesozoic was a time of transition as life on Earth was recovering from the Permian mass extinction. The vast and arid interior of Pangea presented a hostile living environment. It was the reptiles that better adapted to the extremes of temperature and moisture developing thick, leathery skins on both their bodies and their eggs. The further evolution of reptiles gave rise to new species, including the dinosaurs which made their first appearance in the Triassic, and diversified to dominate the terrestrial faunas for the next 180 million years. 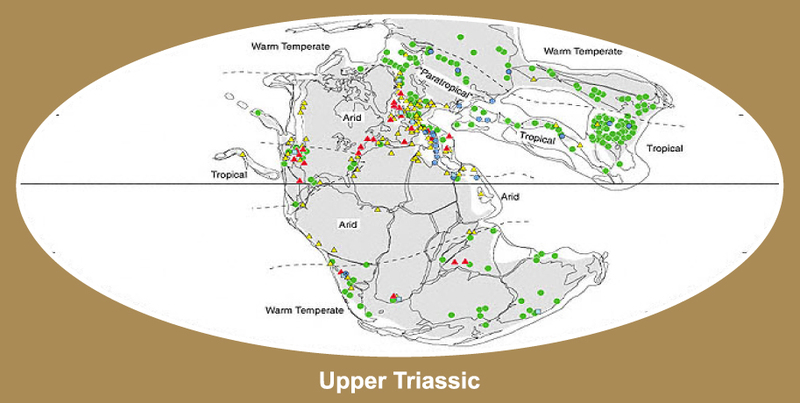 There was no development of polar ice-caps during the Mesozoic, and global temperatures were generally high, averaging at ca. 20º C indicating a much warmer climate compared to our present conditions. Climate History maps by C.R. Scotese, PALEOMAP Project.